An emergency room nurse who was brutally attacked on the job is now one of the driving forces behind a bill that would require safety plans for health care workers, CBS Boston reports. 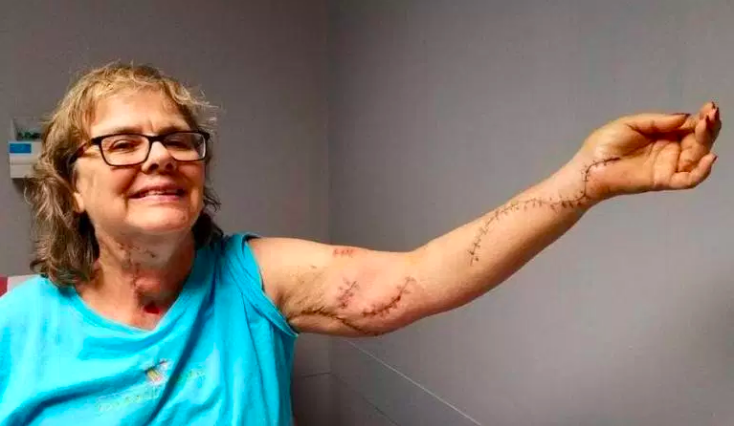 Elise Wilson was assessing a patient at Harrington Hospital, in Southbridge, Massachusetts, in June when he suddenly came at her with a knife. "I could have lost everything," Wilson told the station. "All of a sudden he swung at me and he punched me in the head. And when I turned back to look at him again, he was standing over me and he had a knife in his hand and he had it raised over his head and the next thing I knew he stabbed me in the neck," she said. The patient, who suffers from mental illness, also inflicted deep wounds to her arm as she tried to defend herself, severing nerves that have left her arm with limited mobility. Conor O'Regan, 24, was arrested for the attack and reportedly told police he was unhappy with the hospital's care. A clinical psychiatrist testified in court last month that O'Regan is schizophrenic. "I lost out on finishing out my career the way I wanted to. I've lost out on months and months and months of my life," said Wilson, who has 40 years of nursing experience. She is undergoing intensive therapy and may need additional surgeries. The bill, now known as Elise's Law, was approved this week by the Joint Committee on Public Safety and Homeland Security of the Massachusetts state legislature. Her husband, Clifton Wilson, testified about the impact the assault has had. "These people shouldn't have to go to work every day wondering if they're going to go home," he said. Harrington Hospital has installed metal detectors within the last few weeks, already confiscating nearly a dozen knives, and nurses now have panic buttons for emergencies. Elise Wilson hopes it can be a model for other hospitals. "He came in nonviolent, we were having a normal conversation and it changed like that. That's how it can change," she said. Wilson doesn't know if she'll ever be able to return to nursing, but if the day comes, she and her husband hope it's under a new law. "I almost lost her, and that's the key to this whole thing," Clifton Wilson said.